On day #3 in Norway we woke up to cloudy, snowy day. From our room we took this picture of our hotel. The big picture windows to the lower right of the photo where right in the restaurant area where we had our big amazing Norwegian breakfasts. It turns out that there isn't much open on a Sunday in Norway - most restaurants and shops seemed to be closed. Instead of window shopping, we set our sights on the big bridge we could see from our hotel window and decided to walk over the bridge (there was a pedestrian sidewalk). It was cold and windy on the bridge, so we stopped halfway and decided to get some food. We stumbled upon a cozy little cafe called Aunegarden and stopped in for lunch. The meal was great, and there happened to be some politician or celebrity there because the place contained a few awkward bodyguards on headsets (and a black Mercedes was running just outside the restaurant). We had no idea who the person was - so the whispering and staring of the other Norwegians was lost on us. Next we headed toward the airport for our 5pm flight to Sørkjosen. Turns out that snow and wind that kept us from crossing the bridge - also canceled our flight. Although it turns out that the airline (Wilderoe) is INCREDIBLY well prepared for this sort of thing. They gave us each 25 Euro to get a snack, and by the time my panini was done toasting, a nice bus was waiting in departures to take us to Sørkjosen (4 hours). I was amazed. In the US they would have told us to come back tomorrow. The bus was great. I ate my sandwich and played Settlers of Catan on my hubby's iPhone. The bus actually dropped us off at our next hotel, which was actually about 30 minutes before Sørkjosen. It was like we'd walked into heaven. 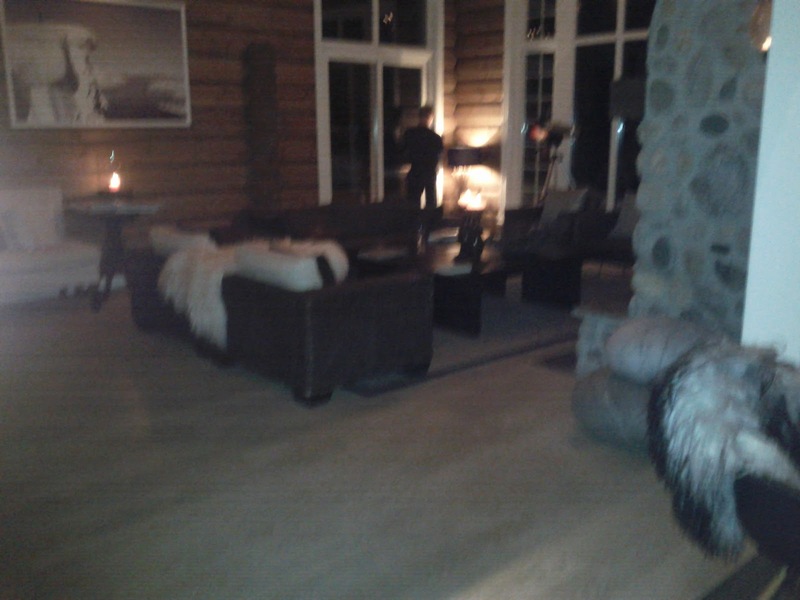 The hotel - called Lyngen Lodge - was amazing. A warm and toasty log cabin decorated like a chic Norwegian hideaway. All meals are provided by Lyngen Lodge and our first night we had a reindeer stew. It was SO good - hearty and warm. Just what we needed after a long bus ride. It was literally heaven. From the minute we walked in, I wish we had planned more time at Lyngen Lodge! It was insanely beautiful and comforting. Everything I wanted our Norwegian adventure to be.